I can’t believe school is starting back!! This giveaway will help with school supplies and more! How would you like to win $200? Scroll down to enter! Disclaimer: This blog and any participating blogs did not receive compensation for the published material in this post. No purchase required to enter this giveaway and there is a limit of one entrant per household. Void where prohibited. Odds of winning are determined by the number of valid entries received. 1 winner will be chosen by Random.org and will be emailed via the email address used to enter the contest. New winner(s) will be chosen if the original winner(s) has not responded within 48 hours of email notification. My Dairy-Free Gluten-Free Life is responsible for shipment of prize. This giveaway is not administered, sponsored, endorsed by, or associated with Facebook, Twitter, Google, Pinterest or other social media outlet. A disclaimer is posted in accordance with the Federal Trade Commission 10 CFR, Part 255 Guides Concerning the Use of Endorsements and Testimonials in Advertising. 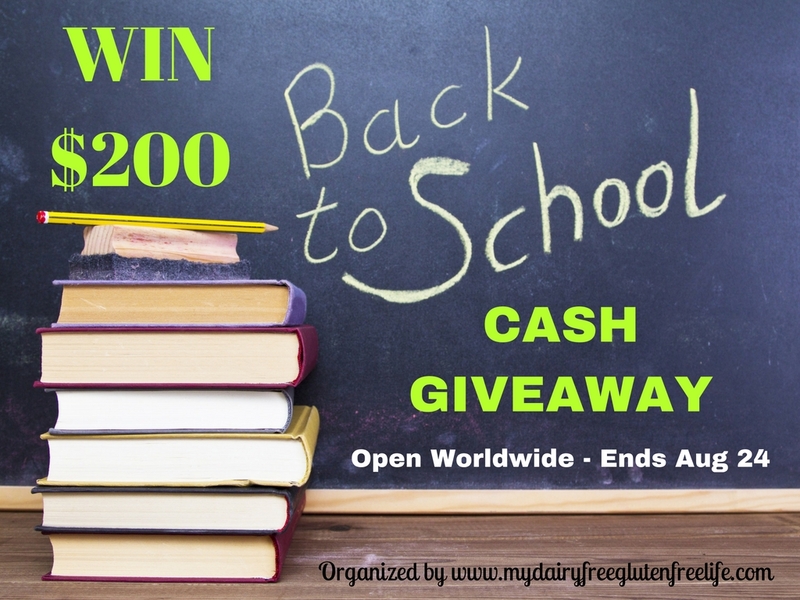 Filed Under: Give Away!, GIVEAWAY Tagged With: $200 Back to school giveaway, Giveaway!! having a good excuse to buy all kinds of things on sale all over the place! The best thing is getting back into the routine of the school year. The best thing is to pick up school supplies with my kids. Shopping! I know it can be hectic but I like it.